So Newcastle lift themselves off the bottom of the Premiership table and move into 10th place with a comprehensive victory over third-placed Leicester Tigers.But that's just the start of the weekend's action. Don't forget that tomorrow we will be bringing you live Premiership text and radio commentaries from four games and keeping you across all the action from the Six Nations. You can read Gary Smee's report from tonight's game here.Here's what's coming up in the Premiership on Saturday. Worcester v Bath (15:00 GMT)See you then, goodnight. Newcastle fly-half Craig Willis told BT Sport: "We knew set-piece wise we had to bring it today and I thought our defence today was outstanding. "That set the foundation for the rest of the game and put us in a good position. "We've been good in patches throughout the year but in this league you need to play for 80 minutes and fortunately today we did and we came away with the win. "We've got some good home form and we need to make sure that it continues until the end of the year." And they've done it. Newcastle Falcons secure their fifth straight victory at Kingston Park and their first win over Leicester in almost seven years.Tigers were outplayed in both attack and defence and lose their second Premiership game in a row following defeat by Sale last weekend. 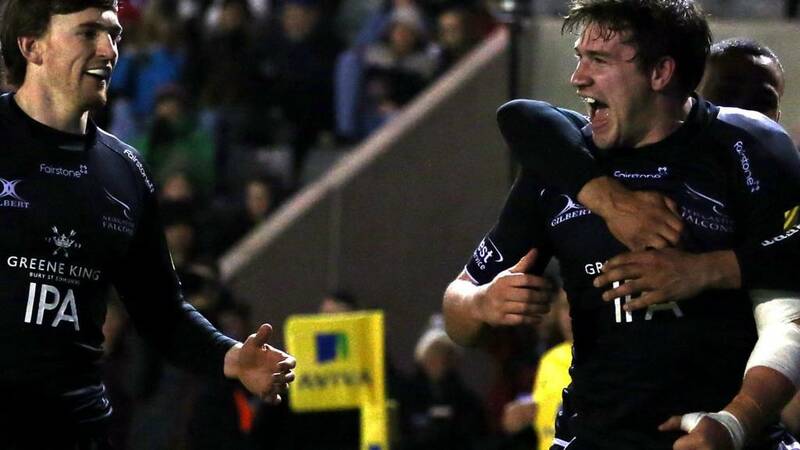 Replacement Craig Willis slots three points to complete the victory for Newcastle Falcons. Sean Robinson, who has been commanding at the line-out all game, takes another catch and the referee blows for yet another penalty.Falcons will kick to the corner and try and reset another drive. Outstanding defending from Newcastle as they squeeze Telusa Veainu into touch and secure their line-out ball. Another penalty goes against Leicester for interfering in the air and Falcons are three minutes away from their fifth consecutive home win. Five minutes left to play here as the rain turns briefly to hail. Leicester also looking to the heavens as yet another attack falls flat and their playmaker Freddie Burns is down in the midfield.It looks like he took an accidental knock to the head off George McGuigan's knee. Ollie Bryant comes on to make his Premiership debut with his side in trouble and running out of time. Freddie Burns with a good kick to touch as Leicester take a line-out on Newcastle's 22-metre line. Leicester have been outplayed for much of the game but they're looking to finish with a flurry here as the rain begins to crash down. It had to happen eventually.But inevitably, Newcastle's defence win another turnover and snuff out the Tigers' threat. Newcastle are back on the attack again but they're struggling to make any headway in their 18th phase of possession. The Leicester defence are continuing to keep them at bay as Falcons eventually put the kick up and an exhausting passage of play is brought to a close by Telusa Veainu's kick to touch. Leicester are back in it. Great work initially from Laurence Pearce who ignores the first opportunity to offload, but he gets the ball back out wide and dives over the line.What an impact from the substitute. We go back for more foul play and Gonzalo Camacho is penalised for lifting the leg in the maul. It's against the laws and Newcastle clear their lines. Leicester's unhappy evening continues. The referee screams tackle as Newcastle are penalised for not rolling away. Leicester with another line-out and we're back where we started.Leicester with a determined drive but Falcons have done enough and they win the turnover. A heroic defensive effort. The TMO intervenes and we're taking a look at the tackle on Tom Croft as he gathered Freddie Burns' cross-kick. We go back to the incident and Adam Powell is penalised for tackling the player in the air. Leicester could have a lifeline here. Into the corner they go. It's been a hugely physical encounter this evening as Newcastle continue to hassle Leicester's runners. Freddie Burns fires a high kick which is collected by Tom Croft and after 58 minutes, they finally make it into the Newcastle 22.But soon after, Matthew Tait knocks on as the crowd begin to jeer. Oh dear. Leicester are finally making good ground as they head slowly into the danger zone. But after all that effort, they knock the ball on at the vital moment. Accuracy killing Leicester so far. Leicester ringing the changes here as they try to get out of their half. They still haven't entered the Falcon's 22 with just over 25 minutes to play at Kingston Park. Andy Goode makes no mistake this time and slots his kick through the posts. Newcastle with a reward for all their possession but they're not out of sight yet. Falcons have possession again and are attacking the ball at pace. Marcus Watson with another shake of the hips and he dances through a Tigers defender. Referee blows his whistle again and Newcastle have another chance to add three points. Micky Young with a clever play as Leicester are pulled for offside. Plenty for Newcastle to smile about at the moment. Andy Goode screaches in frustration as he misses a vital kick. Newcastle are enjoying a good start to the second half. Leicester the first to make changes as Sebastian De Chaves comes on to replace Michael Fitzgerald. Tigers with an early jump at the line-out and Falcons will take the penalty.